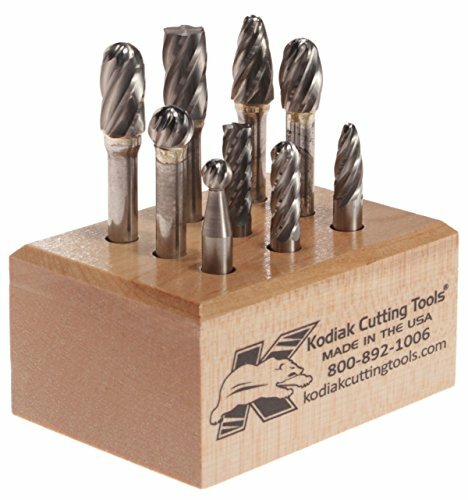 This carbide bur set features high quality double-cut USA made Kodiak brand carbide burrs which are made from premium carbide. This kit contains 9 aluminum/non-ferrous cutting burs in assorted style heads on 1/4" shanks for a wide variety of grinding and deburring tasks. Assortment includes aluma-cut burs on a 1/4" shank in the following shapes and head diameter sizes: SA-1NF 1/4" cylindrical bur (non end-cutting)SA-3NF 3/8" cylindrical bur (non end-cutting) SC-1NF 1/4" cylindrical ball nose bur SF-1NF 1/4" round nose tree shaped bur SF-3NF 3/8" round nose tree shaped bur SD-1NF 1/4" ball shape bur SD-3NF 3/8" ball shape bur SE-3NF 3/8" egg shape bur SC-3NF 3/8" cylindrical ball nose bur wooden stand.